Depending on who you talk to, the demise of the honey bee has become one of the more powerful cautionary tales of the dangers of environmental toxins, global warming, or species extinction. Most publicly, Colony Collapse Disorder has spelled sizable trouble for big agriculture in the U.S. and beyond. Almond and apple growers, for example, rely almost exclusively on these productive little pollinators. But bees aren’t just important in the countryside; they’re also crucial to the functioning of urban ecosystems, to the annual yield of community vegetable plots, and to the success of municipal botanical gardens. 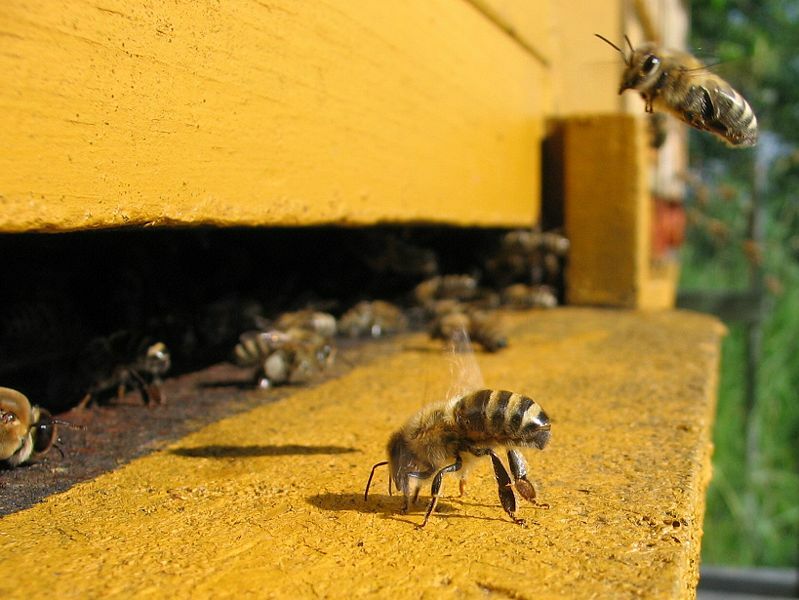 Next week, beekeepers, environmental activists and nature lovers across the U.S. will be celebrating Pollinator Week to draw attention to the plight of these four-winged fertilizers. While there are many provincial affairs planned, some of the more interesting events will be happening in cities. NYC’s very own Just Food, for example, has some great stuff planned out for us. As their website points out, the Big Apple is one of the few major cities that has kept beekeeping illegal. It is fitting then that most of their activities are geared toward a campaign to legalize urban hive tending. Fear not, the celebrations will not be dedicated solely to the signing of petitions and the sending of messages to elected officials. At the end of the week (Friday the 26th) there will be an all-day Honey Fest at Union Square. If you’re in the city, come sample the sweetness! Located in Minnesota, I enjoy the cropped photo of the bee fanning the hive. Do you have a full-sized picture that would “bee” appropriate for wallpaper (1600×1200)? We are also very concerned about the health of honeybees, noticing the increased difficulty in keeping a hive alive. Found your site looking for more information on bee-habitate, etc.